In August 1908 Diepenbrock took up another poem by Clemens Brentano, a German writer he had known since his childhood: Der Abend (The Evening). The nocturnal atmosphere, a recurring topic in both their oeuvres, is reminiscent of Brentano’s Der Spinnerin Nachtlied (The Night Song of the Spinner) that Diepenbrock had set to music ten years before for the soprano Aaltje Noordewier-Reddingius (Lied der Spinnerin, RC 42). Diepenbrock did not immediately decide to set Der Abend for soprano and piano. Two incomplete versions preceded this opus: one for vocal quartet (RC 88) and one for soprano, alto and organ (RC 89). On 22 August, the same day Diepenbrock notated these fragments, he also started the version for high soprano and piano. He completed the song on 11 September. 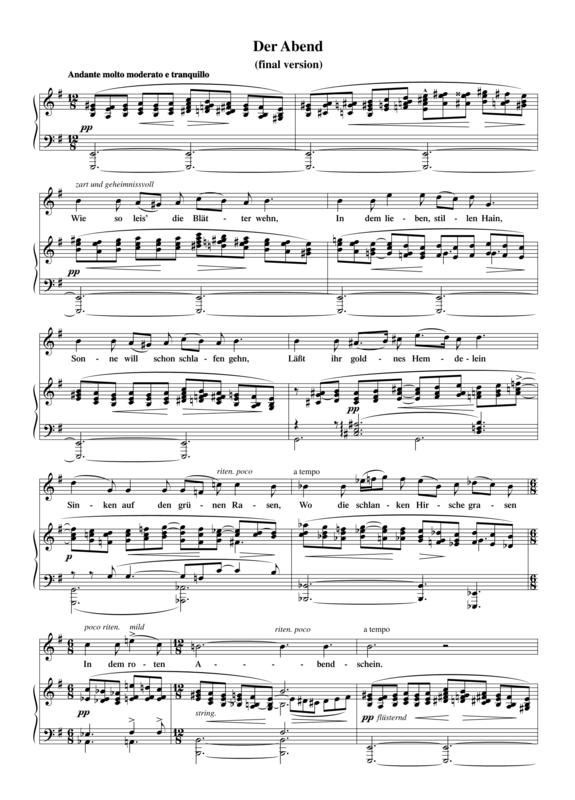 I have made this somewhat in the hope that Noordewier would sing it on her tour with Verhey, because a diligent organist can play it on the organ and no other instrument can produce the long pedal points that are supposed to depict the peace of the evening as well as the organ. But their programmes had already been fixed. In order to come into its own the Brentano song needs to be orchestrated, and there again it might be out of place in a large concert hall with everything that comes with it. Pianists could never play that. Diepenbrock has made some changes to the text of Der Abend. The most drastic one is the omission of the two-line refrain with which each of the five verses of Brentano’s poem concludes. From the court of the vain crowd. As in the court of the vain crowd. Hondius van den Broek thought the song was delightful and wrote in his letter of thanks to Diepenbrock: The depiction of the evening with which it opens immediately hits home, that’s it. (BD VI:16) He is referring to the organ point that lasts several measures in the left hand, combined with a slow rocking motion in a 12/8 metre in the right hand that prepares the entry of the voice (zart und geheimnisvoll). In order for the organ point to continue sounding, Diepenbrock added a footnote with the instruction: Please note, hit the bass notes of the organ point as many times as necessary, though never on a strong beat. "The end of the fourth strophe is beautiful: Gott der über alle wacht (God who watches over all), but the final strophe is the most delightful, the way you have incorporated the evening motive into it, which leads to the climax on Sicher ruhn (safely rest)." As mentioned, the soprano Diepenbrock had in mind for Der Abend was Aaltje Noordewier-Reddingius. In November 1906 she not only sang the solo part of Diepenbrock’s Hymne an die Nacht “Gehoben ist der Stein” (Hymn to the Night “Uplifted is the Stone”, RC 49) several times, but she also premiered the orchestrated version of the Lied der Spinnerin (Song of the Spinner, RC 75). At her recital of 5 January 1909 she gave the first performance of Der Abend in The Hague, alongside three other songs by Diepenbrock: Ik ben in eenzaamheid niet meer alleen (I Am No Longer Alone in Solitude, RC 41), Clair de lune (Moonshine, RC43) and again the Lied der Spinnerin (RC 42). Diepenbrock honoured Noordewier-Reddingius by dedicating Der Abend to her in the printed edition of 1910. 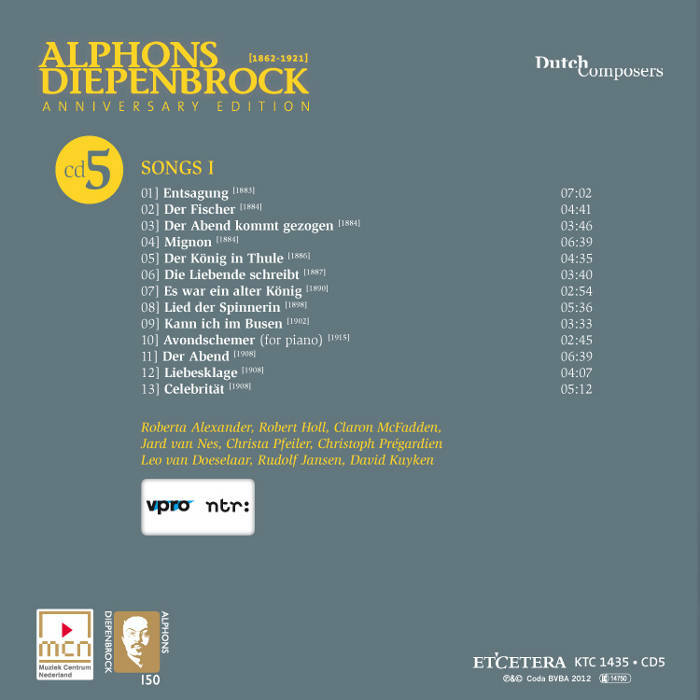 Diepenbrock completed the intended orchestration of Der Abend (see RC 92) in April 1910. 5 jan 1909 Eerste uitvoering van Der Abend in Diligentia te 's-Gravenhage door Aaltje Noordewier-Reddingius en Julius Röntgen. Van Diepenbrock worden ook uitgevoerd Ik ben in eenzaamheid niet meer alleen (RC 41), Clair de lune (RC 43) en Lied der Spinnerin (RC 42), voorts vier liederen van Hugo Wolf en vijf van Gustav Mahler. Diepenbrock woont het concert bij. Diepenbrock vordert veel en gaat bijzondere wegen; niet overal kan men hem aanstonds volgen. Niet overal gevoel ik mij in sympathie met hem. Van Clair de lune (Verlaine) bewonder ik meer de kleur dan de gedachten; in het Lied der Spinnerin (Brentano) komt de muziek, hoe bekoorlijk ook van klank, mij voor de stof niet eenvoudig genoeg voor; in Sonnet (K. Alberdingk Thijm) en in Der Abend (Brentano) mis ik eenheid van stemming. Is die poging tot schildering in couplet 4 van Der Abend niet wat kinderachtig? Mevr. Noordewier zong de twee eerste vooral schier volmaakt, echt poëtisch.